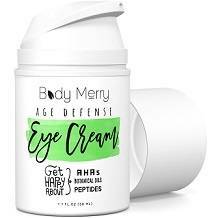 In this review the daily eye cream Age Defense Eye Cream will be examined. This product is manufactured by the company Body Merry. The product has been formulated for wrinkles, dark circles, and bags, hydrating the skin. This product is suitable even for sensitive skin types. Continue reading this review to learn the facts about this eye cream product. These ingredients help to hydrate the skin, plumping it and reducing fine lines and wrinkles. These ingredients also help the blood to circulate, removing old blood and reducing the build-up which can lead to dark circles. However, this product lacks the inclusion of at least five patented, clinically proven ingredients which would have indicated the quality of the product. User instructions are clear. The face should first be cleaned. The serum may then be applied; a moisturizer may be used over it . This eye cream product may be applied mornings and evenings. This product is available online directly from the manufacturer. A 1.7-fluid ounce (50 ml) bottle is available at $15.99 for a one-time purchase. If willing to be locked into a subscription, the consumer can save 10%, paying $14.39. However, one may find it difficult to cancel these agreement; meanwhile the credit card is being deducted. This manufacturer of this particular eye cream product offers a 90-day money-back guarantee, only valid for the first product a consumer purchases on either the manufacturer’s website or their Amazon shop-front. The manufacturer of this cream does not state condition in which the product must be when returned. This product appears a good eye cream. It comes with a 90-day money-back guarantee, and the instructions are clear and simple. However, the company fails to offer the consumer any discounts nor any package deals that would save them money in the long run. More so, the list of ingredient in this product is extensive. These ingredients could react against the rest, but can also increase the consumer’s chances to have a side effect reaction to.